● Reduction of driver circuitry from 3 tubes to 2. ● Elimination of the separate high voltage transformer. ● Elimination of the bias transformer. These developments greatly lower costs allowing many more people to enjoy the unmatched sonic qualities of OTL amplification. A power output of 15 watts per channel will drive many high-performance loudspeakers on the market. As speakers move up on the efficiency scale, the need for high-power amplifiers declines. Our new DIY Speaker design is an excellent match and will provide extremely loud sound levels. Nothing sounds better than an OTL. 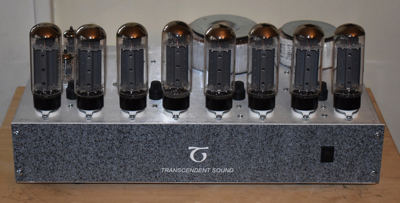 No transformer coupled amp, no solid state amp can match the sound. It cannot be imitated. Striking imaging causes instruments to be layered in a three dimensional sound stage that recreates the experience of a live performance. The music "opens up" and leaps out of the loudspeaker eliminating any box like sound. The most minute and subtle sounds are revealed producing uncanny realism. Musical voices are warm and lifelike yet completely neutral with a razor sharp focus. Nothing else can compare. Don't just listen to your music.... experience it. All of the clarity, openness, air, and naturalness that Transcendent Sound OTLs are famous for have been retained in this design. There is no loss in performance. Be the first kid on the block to own one and order today! Easy to Build! The assembly manual uses 100% color photographs. No diagrams are used. Eight different colors of wire are included to further ease assembly. Size: 17 inches wide by 10 inches deep. Power Bandwidth: 10 Hz to 25 kHz.